How long is long in the music business? STEPHEN LEE NAISH looks at a future Manic Street Preachers. 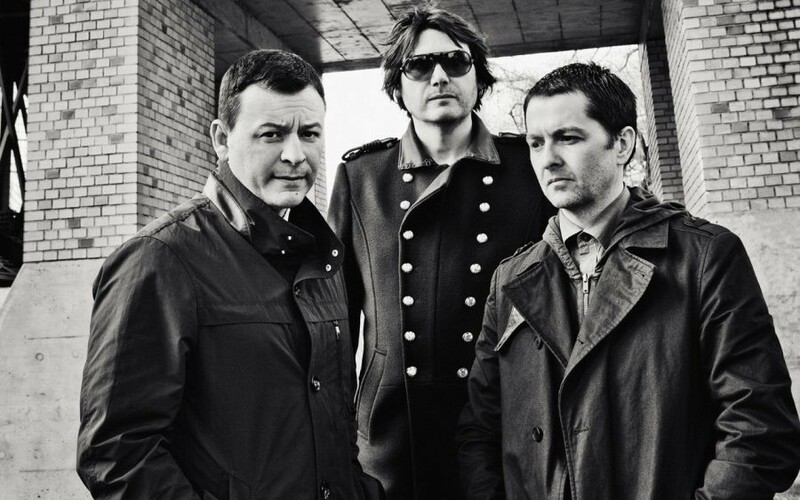 The Manic Street Preachers have never shied away from the inevitable demise of the band. As early as their 1991 debut record Generation Terrorists they were proclaiming in the music press that the record was to be their first and last statement. They would, after the record sold sixteen million copies and they had played a string of sold out shows at Wembley Stadium, split up and never return. The record didn’t achieve sixteen million and Wembley wouldn’t happen for a few years yet. During the slogging tour to promote the mega-selling This is My Truth Tell Me Yours in 1998/99 they confessed in an American interview that they were closer to the end of the band than the beginning. The concert that saw them say goodbye to the twentieth century at Cardiff’s Millennium Stadium in front of an audience of 52,000 felt like an epoch, as if the band could call it quits and walk away there and then having achieved everything they ever set out to do. Of course they marched on. In the past decade it has felt like each new record could be a signal towards an end. Postcards from a Young Man (2010) was ambitious but it was, as the band intended “one last shot at mass communication”, a final attempted to see if they could pull off one last hurrah! Rewind the Film was the band’s most subtle and sombre record, a reflection of years of emotional and physical turmoil being in a rock and roll band. The tone of the record could be akin to pulling up a nice cosy blanket and snoozing off for good. Yet its immediate follow-up Futurology felt like a fresh intake of air and renewed sense of hope that the band might continue with renewed vigour. If it had finished there it would have been a satisfactory closing statement. The band’s new record Resistance is Futile is as of this writing an unknown quantity. If the singles International Blue, Distant Colours and Dylan and Caitlin are anything to go by then we can expect a shiny and fluid set of songs that owe something to Futurology, but also to the vigour of their youthful endeavours. With Resistance is Futile, the band has once again signaled that this could be the last record. The process of writing and recording Resistance is Futile was as Nicky Wire has suggested in numerous interviews, arduous, with the break through only coming when International Blue blasted through like a ray of sunshine and suggested the direction the album should take. Even as a long-time fan of the band, I’m still not done with them; I’ll probably never be done. I think I share this with the majority of fans who shape their lives around the Manics record releases and tour dates, who live and breathe those lyrics and shiny choruses and travel extensive distances to old record shops in the hope of finding a rare vinyl EP or single in some dusty old display case. I’ve spent hours in contemplation about a future roster of records that still have to be fulfilled. Here are my suggestions. Nicky Wire’s solo record I Killed the Zeitgeist (2005) was something of a revelation. It was musically capable, with stomping indie and surging punk rock, as well as some touching ballads. The record was also lyrically superb, touching on personal angst, loss and hope. In the past, Wire had been viewed as a competent bass player but a bad singer. His vocal turn on Wattsville Blues from Know Your Enemy was unapologetically terrible. Lou Reed meets Mark E. Smith on a binge of cigarettes and a bout of flu. Yet Zeitgeist disproved this. When the music matched, Wire’s voice, his singing became an impressive counterpart and the lyrics took on an even more desperate means of communication in Wire’s drawl and drone. It also showed that Wire as musician had been overlooked somewhat. Yet this shouldn’t have been the case. His bass work on The Holy Bible had given that record a sense of guidance and impending doom and gloom that perfectly captured the mood of the record. His base lines are the record’s bleeding broken heart. Look also to Everything Must Go, especially on the track Interiors (Song for Willam DeKooning) in which the bass lines fight and throb against the verse before letting go and exploding Â into one of the record’s best and most progressive choruses. In the past few years, Wire has taken lead on writing lyrics and music for some of the band’s best songs. Your Love Alone Is Not Enough, the comeback single from Send Away the Tigers, for which Wire wrote the music sparkled and shined like no other Manics track in quite some time. Marlon JD from Journal for Plague Lovers is a bristling number that comes from Wire’s pen, whilst the Wire led The Future Has Been Here 4ever from Postcards from a Young Man puts Wire centre of a pumping rock anthem. Arguments could be made against Wire-led compositions such as Dying Breeds, Engage With Your Shadow and Failure Bound as filler dross, but even these tracks show competence and experimentation that goes beyond the core Manics sound of the main albums. A Nicky Wire led album would mean music, lyrics and vocals by Nicky Wire, with James Dean Bradfield and Sean Moore providing back-up. This record could also feature an array of guest vocalists to complement and break Wire’s croon and even re-create some pop magic moments reminiscent of Wire’s vocal contributions to Sarah Cracknel’s single Nothing To Talk About. But mostly I would want a Wire-led record to be a sprawling mix of ragged punk rock and quality pop, a natural spiritual sequel to Know Your Enemy. There was talk years ago of a seventy track triple record (to be titled 70 Songs of Hatred and Failure) and what better way to fulfill this promise than a collection of short and sharp Wire songs. The most definitive element of a Manic Street Preacher song is its lyrics. The band has made songs that deal in yearning poetic melancholy their bread and butter. But glued to these lyrics is music that when at its best glides, bursts, and shimmers, evoking an intensity that rarely sees the light of day in mainstream rock. All three band members are expert musicians who have, over years of playing together, become a symbiotic unit, which sounds cliché, yet is no less true. The band has been playing in the instrumental format for years. The first being Horses Under Starlight, a Bacharach-esq jive that sat as an oddity on the Kevin Carter CD single released in 1996. Since then there have been other examples that usually sit as flipsides on singles releases. You Know It’s Going to Hurt, The Vorticists, Ostpolitik, See It Like Sutherland, Alien Orders/Invisible Armies are prime examples. Only very recently did instrumentals begin cropping up on the main records. Mayakovsky, and Dreaming a City (Hugheskova) were included on the record Futurology, evoking the motion through sunlight European cities, passing high-rise blocks and brutalist architecture. Another pointer to this instrumental adventure would be James Dean Bradfield’s hypnotic soundtrack for the 2016 film The Chamber, which shows a brilliant understanding of communicating a sonic mood without the necessity of lyrics. They could pull off a studio instrumental record with little effort, but touring the thing would be out of the question. The fans demand the right to shout the band’s lyrics back, so an instrumental record would have to come during a fallow period, or one of those junctures of reaction when the band intentionally veer into a alternative reality to escape their own past. 2002’s Lipstick Traces: A Secret history of Manic Street Preachers was a satisfying collection of the band’s B-sides, covers and oddities. The most startling of which was the unheard acoustic stomp of Nirvana’s Been A Son. But to any fan of the band, most of these tracks had been heard in their original incarnation as B-sides or live tracks. Since the release of this compilation the band has racked up a truly impressive back catalogue of B-sides that have broadened their sound in many different ways. One need only look to the B-sides featured on the single releases from Send Away the Tigers to understand that a whole other record of anthems was stored in the band’s collective brain. The B-sides Anorexic Rodin, Love Letter to the Future, Heyday of the Blood, Boxes and Lists, 1404 and Little Girl Lost would have fit comfortably on the mother record. That these tracks are lost to B-sides is a great shame. So another archive pummelling collection would be most welcome. Not long after the release of the single It’s Not War Just The End of Love I made a personal decision to stop by physical format releases for Manics singles. I’ve got a few reasons for this, being on the brink of fatherhood was one of them and knowing disposable income would now be allocated to disposable diapers. So, apart from excavating YouTube for these tracks, I have no idea of what the band have been releasing as B-sides for almost a decade. This is a pretty big gap in my experience that would be instantly filled by the release of a juicy compilation record. There is a danger that suggesting these directions will inevitably mean they will never be taken. Maybe this isn’t such a bad thing. The band is currently on a run of hugely successful records and a creative drive most bands in this stage of their careers would have said goodbye to years ago. Veering off into records that offer a challenge to the listener’s patience is perhaps unwise in an era where bands can be broken by one underperforming release. What I have suggested is what I would consider a fool’s errand that would please maybe a miniscule sect. I long for the danger of records like Generation Terrorists, The Holy Bible, Know Your Enemy and Journal for Plague Lovers, so am drawn to a version of the band that is somewhat detached and antagonizing. With stating these future records, I am basically longing for the past. 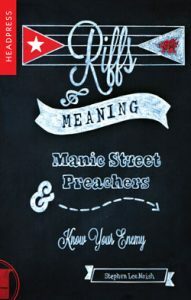 For more on the Manic Street Preachers check out Riffs & Meaning: Manic Street Preachers and Know Your Enemy.